When preparing a meal don’t forget the accompaniments. Italian dishes would not be complete without a side order of garlic bread and naan bread with an Indian meal is really tasty. It seems quite lazy to keep purchasing these items in your supermarket when the homemade versions are not only better tasting but easy and cheap to prepare. With a little forward planning these breads can be made from store cupboard ingredients and bread from your freezer. This recipe can be prepared whilst you are cooking your curry. Perhaps try making a batch for the freezer in readiness for a quick tasty supper. If you have invested in a bread maker or are adventurous enough to make your own bread from scratch items such as yeast will be a regular store cupboard ingredient already. First take a small bowl and add a little warm water, two tablespoons of dry yeast and the sugar. Stir and leave in a warm place until the yeast has frothy foam on the top. This should take between five and ten minutes. If nothing happens the chances are that your yeast is too old and should be replaced. In a large mixing bowl add the flour and other ingredients followed by the now frothy yeast mix. Stir well until well mixed and forms a stiff mixture. Turn out onto a floured surface and knead well for ten minutes. At this point the dough will feel soft, smooth and pliable. Put back into the mixing bowl and cover. Leave in a warm but not hot place for twenty minutes. You will find that the dough has risen well. Divide the dough into eight pieces. 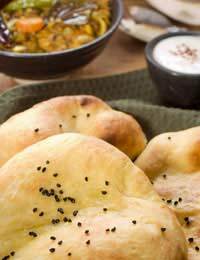 Take each piece and roll into an oblong naan bread shape of around a quarter of an inch in thickness. Place on a greased tray and place in the middle of the oven for about twenty minutes or until they have risen. If you are cooking on an Aga type cooker it is possible to cook on the top of the hob making sure that it is not too hot. The quickest way to make garlic bread is to cook under the grill. But, if your oven is already in use place the prepared garlic bread onto a tray and into the top of the oven turning after ten minutes. Crush the garlic cloves and add to the soft butter along with the parley and cream well together. Divide the mixture into two portions. Cut the French stick into one inch thick pieces and spread each slice on one side with the garlic butter mix. Place under a hot grill and toast until golden brown. Carefully remove from the grill, turn the bread slices over and spread the remaining portion of garlic butter mix on the other side. Return to the grill and toast. You can prepare a low fat version using a low fat spread. Adjust the amount of butter or garlic according to taste.